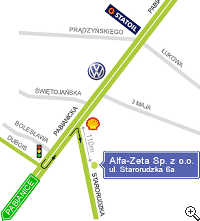 company name: Alfa - Zeta Co. Ltd. The following form will help us to contact you. Fields with * are obligatory. I do agree to process my personal data by Alfa-Zeta Co. Ltd. With its business seat in Łódź, ul. Starorudzka 6a, 93-418, POLAND according to Personal Data Protection Act from August 29, 1997 which guarantees me a right to review, change or remove my personal data. The mentioned personal data will not be disclosed to any third parties and will be only used once to handle this inquiry.